This is the final portion of an ecstatic set of music devoted to the clarinet master Johnny Dodds — as created on November 8, 2014, at the Whitley Bay Classic Jazz Party. The participants: Thomas Winteler, Matthias Seuffert, Claus Jacobi, reeds; Rico Tomasso, cornet; Emma Fisk, violin; Martin Litton, piano; Malcolm Sked, string bass; Martin Wheatley, Spats Langham, Jacob Ullberger, banjo; Nick Ball, washboard. The other postings from this set can be found here and here. The life story of “Washboard Sam,” born Robert Brown (singer / songwriter / washboardist) is melancholy and seems all too familiar: early fame, influential recordings, a short life — 1910-1966 — and burial in an unmarked grave. But his music lives on. Here is a brief but successful musical tribute performed at the 2014 Monterey Jazz Bash by the Bay. At the head of this compact swinging band is the inimitable Carl Sonny Leyland, piano / vocal, with Marty Eggers, string bass; Jeff Hamilton, drums. For this trio of selections, Carl invited the young washboardist Patrick Skiffington to join in, to give the music its proper shaking and rattling quality. 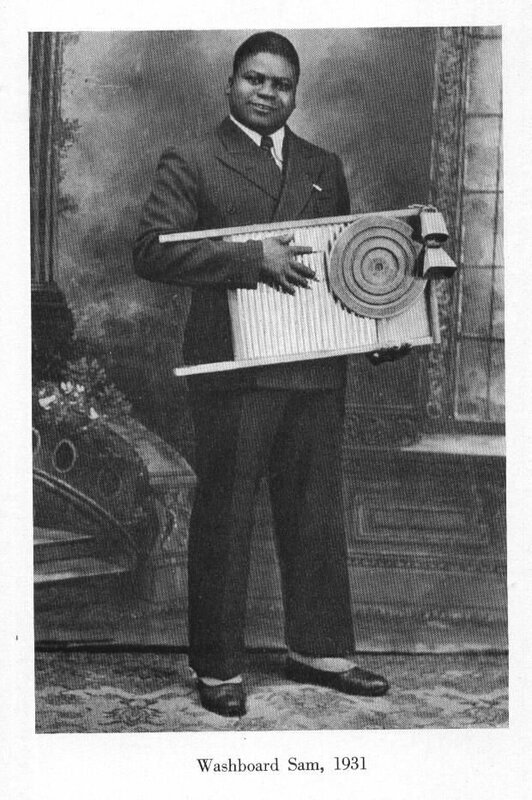 The washboard often has been looked down on in jazz but when it’s played well, it can drive a band (think of the hot records by the Washboard Rhythm Kings circa 1931-33). Young Mister Skeffington knows his craft: as an ensemble player, he listens; he varies his dynamic range, and he’s a true addition to the band, his sounds and rhythms steady and varied. He’s been on the scene a bit, but JAZZ LIVES takes pleasure in welcoming him officially. I wonder if I might see a quartet set by this band at a California festival? An idea whose time might well have come. For the moment, enjoy these three performances. I apologize to those viewers who wanted to see Patrick in all his glory. It didn’t happen during this set — he is mostly hidden — but hearing is believing. Next time, perhaps I will choose a better vantage point. And thanks as always to Carl, Marty, and Jeff, who always create solid vibrations of the finest kind.